Situational awareness: GM posted Q2 results this morning with $36.8 billion in revenue, which is lower than last year's Q2. They also slashed their 2018 outlook, mainly due to rising commodity prices. But investment strategist David Kudla tells Detroit News, "Whatever demand in EVs and hybrids ultimately materializes, GM is ready to meet it, and to compete with Tesla and other automakers in this growing market." Screenshot of chart from the IEA commentary, "Decline in renewables investment is a warning signal for clean energy transitions"
Let's revisit a topic I just grazed a week ago — the International Energy Agency's fear about inadequate global investment on renewable power projects. Why it matters: A new IEA commentary offers a cogent look at why the Paris-based agency says the growth in global investment is lagging behind that's needed to meet international climate targets. The details: Last year, notes IEA analyst Michael Waldron, was on the surface a good year for renewable power, which was two-thirds of all power generation investment amid a big expansion of solar installations and record offshore wind growth. Yes, but: The total renewables investment still declined by 7% compared to 2016, and new capacity additions grew by only a modest 2% thanks to a slowdown in onshore wind and hydro coming online. And from a climate standpoint, looking at zero-carbon energy overall, it's happening alongside a steep decline in new nuclear investments. 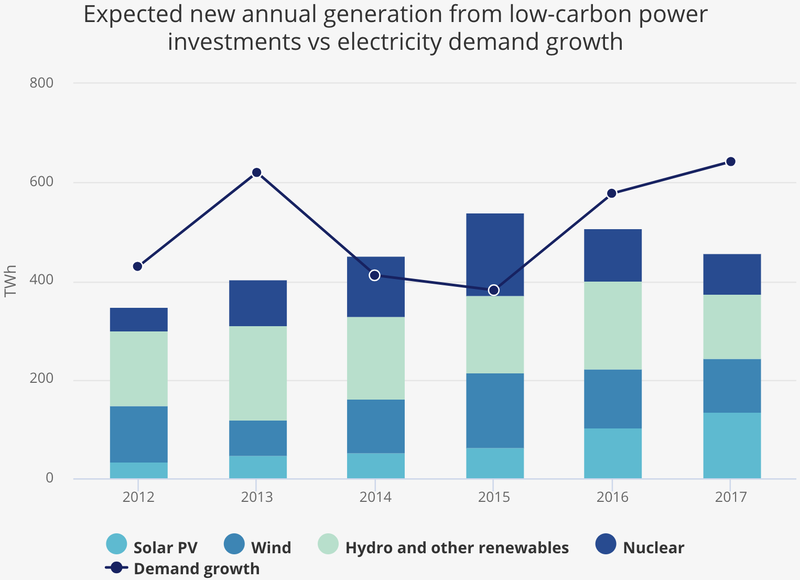 "Putting all low-carbon power generation investments together, their expected new annual output fell by 10% in 2017, the second straight year of decline, and did not keep pace with demand growth," Waldron notes. "This spells a worrying trend for power sector-related CO2 emissions, which grew by 3% in 2017, on the back of a rise in China and India, where renewables deployment was large, but coal power filled the supply-demand gap." The bottom line: Waldron puts the investment levels in the context of IEA's Sustainable Development Scenario, which is a future consistent with h0lding the global temperature rise under 2°C (the target of the Paris climate agreement). "[N]ew renewables generation needs to rise rapidly and global investment in renewable electricity needs to almost double to meet these goals, to nearly USD 550 billion per year by 2030," he writes. Axios' Amy Harder reports ... Oil-and-gas giants Royal Dutch Shell, BP and Equinor have signed onto a letter that praises new House carbon tax legislation, multiple sources said. Why it matters: These companies, along with a few other big oil-and-gas producers, have long said they support a tax on carbon emissions. Signing a letter — even though it’s still just a letter — could bring more active lobbying on the bill. The letter is still circulating among companies and other parties. Where it stands: The bill, which would replace the federal gas tax with a carbon tax, was introduced Monday by GOP Rep. Carlos Curbelo with one fellow GOP co-sponsor, Rep. Brian Fitzpatrick. Yes, but: The letter does not explicitly endorse the bill. Instead, it’s expected to broadly praise the measure and its role in jumpstarting a long dormant policy conversation in Congress, according to people who have seen a copy or are familiar with it. The bottom line: Curbelo's legislation is symbolically important but has zero chance of passage in the foreseeable future, thanks to powerful GOP opposition to carbon taxes. My thought bubble: A big question is whether Exxon, the most powerful U.S.-based multinational oil giant, will ever come off the sidelines. Exxon has for years said it backs a carbon tax. But the company doesn't actually prod Congress on the matter, despite joining a coalition last year called the Climate Leadership Council that's pushing a tax proposal. Here's a question rattling around oil circles: Is the market taking Iran's threat to close a vital oil shipping chokepoint seriously enough? Why it matters: It's a threat — which Iran has made more than once over the years — that's unlikely to happen and hugely consequential if it's carried out. It would send oil prices skyrocketing. Driving the news: Iran in recent days has threatened to block the Strait of Hormuz, a narrow Persian Gulf channel that roughly 19 million barrels of oil from multiple nations passes through each day, or about 30% of seaborne supplies. The threat has been part of the wider escalation of rhetorical threats and attacks between Iranian leaders and President Trump. What they're saying: “While our military would clearly prevail over the Iranian military in a conflict, I think we ought not be complacent about how long that strait, that narrow strait, would be closed,” oil analyst Bob McNally of the Rapidan Energy Group said yesterday. McNally, speaking at a Senate hearing on oil, said it would take time to clear mines and have insurance companies resume shipping coverage. “That is a deadly serious issue for the oil market to consider,” he said. He later noted that U.S. strategic stockpiles could not be released at a rate even close to fast enough to make up for the shortfall. The intrigue: A Financial Times column explores the topic, noting that the escalation of words between the presidents "has been met with a resigned shrug from the oil market," with little effect on prices. "Though widely seen as an option of last resort for Iran, the frustration over the Trump administration’s withdrawal from the nuclear deal and fears they are pursuing a long-term policy of regime change may alter Tehran’s calculations. Relatively low probability events can have an outsized impact when they occur." Go deeper: This Bloomberg column explores the details of Iran's capacity and planning to cut of the strait. "A new report from ClearPath and the Carbon Utilization Research Council (CURC) suggests that if the US government continues to deploy the right policies, markets will drive the growth of carbon capture." "[T]he report estimates that accelerated research, development, and deployment of the technology could add $190 billion to US annual GDP by 2040, and add 780,000 jobs over the same period." Vatican: An interesting tidbit in the FT's wide-ranging new interview with Exxon CEO Darren Woods, who attended last month's meeting between industry officials (and others) and Pope Francis. He tells the paper there are "still evolving" ideas for some kind of continuing forum between the energy industry, investors and the Vatican. Go deeper: Axios has a story on the June 9 meeting here. "About 90 terawatt hours (TWh) of nuclear generation is scheduled to retire in the next decade, more than all of the US’s current solar generation. Studies suggest that another 135TWh is probably not cost competitive with gas plants and, therefore, at risk of retirement." "This means the source of about 15% of US low-carbon electricity could shut down and largely be replaced by gas, making it harder for the US to meet its emission reduction targets." The Energy Information Administration yesterday released its latest long-term set of global energy forecasts called the International Energy Outlook. This year's edition focuses specifically on trends and scenarios in India, China, and Africa. Those economies (and developing nations overall) are where the lion's share of energy demand growth is expected in the coming decades. But per-capita energy use remains far below U.S. levels, and will for the next several decades at least. "Faster economic growth in China increases energy use, but the magnitude and rate depends on how quickly China transitions to a more service-oriented, personal consumption-based economy." "In the No Transition to services case, delivered energy consumption increases by 25% relative to the IEO2018 Reference case in 2040, compared with a 20% increase in the Fast Transition to services case."